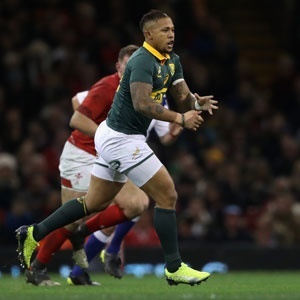 Cape Town - A respected Welsh rugby writer has hit out at Springbok coach Allister Coetzee’s decision to substitute flyhalf Handre Pollard with Elton Jantjies late in Saturday’s Test in Cardiff. Jantjies came on in the final 10 minutes of his side’s 24-22 defeat and made two glaring errors when he knocked on with his side in promising attacking positions. Stephen Jones, who is a veteran Sunday Times rugby writer, was critical of the decision to take off Pollard. “Handre Pollard marshalled things well. It was one of the most catastrophic coaching decisions of the decade when Pollard was taken off with the match in the balance and the fallible Elton Jantjies came on for about 10 minutes of blundering,” Jones wrote. Jones also noted how South Africa’s scrum “made mincemeat of Wales and their driving was good”. He added that the Boks fielded a “speedy back-three who could not defend for toffee”, before continuing: “There were one or two up front, such as Eben Etzebeth and Siya Kolisi, who looked like true Boks. The others were making up the numbers."